Published on November 13, 2010 in Projects. 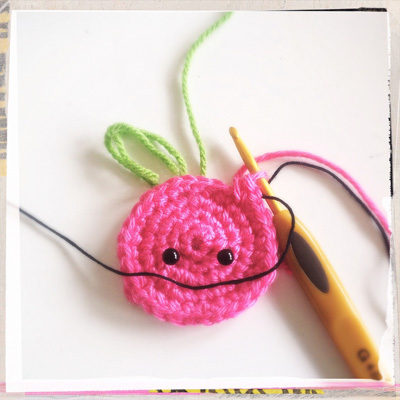 0 Comments Tags: DIY craft, Yellow Cherry, Zakka Sewing. 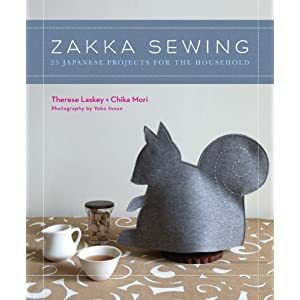 I found an inspiring book called Zakka Sewing. In Japanese, zakka means “household goods.” It refers to taking an everyday object and transforming it into something more artistic. 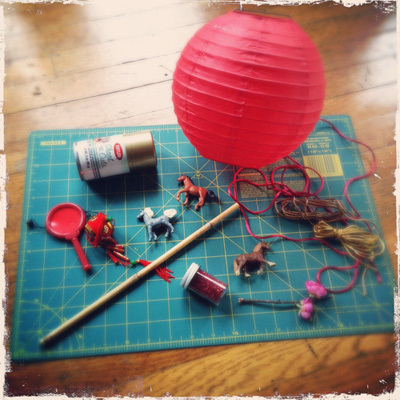 They are still functional objects, but possess beauty and are meant to add style and individuality to an environment. It is the art of seeing the savvy in the ordinary and mundane. The book has different projects that were contributed by some of the best zakka makers in Japan. I especially liked that not only did they have unique design; they had a history of Japanese culture and tradition. One of the projects I particularly liked was making a set of coasters. They used a flower motif to resemble wagashi, Japanese sweets that appear in stores during the spring. In keeping with my aesthetic and that winter is approaching I used a bear design. I wanted my coasters to be cute, charming, and posses a sense of warmth. 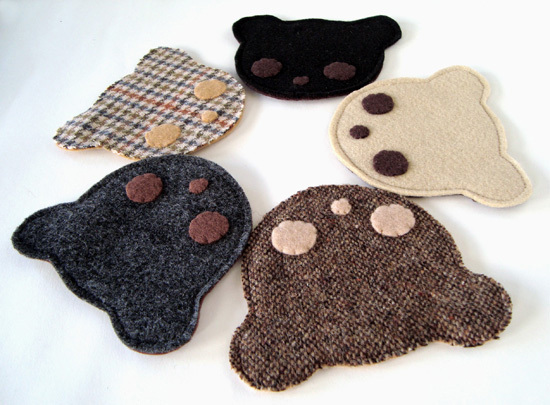 I think they will look extra cozy with a hot chocolate resting on them! Published on March 28, 2010 in Projects. 0 Comments Tags: COLOURlovers, spring color trends 2010, Yellow Cherry color palette. I recently came across this inspiring website called COLOURlovers. It is a creative community where people from around the world create and share colors, palettes, patterns, and discuss the latest trends. The colors for Spring 2010 are military inspired- shades of sand, army green, and hints of black. I created my first color palette with those hues in mind, along with my Olive Green Bird hair piece. Military wear was invented for protective and utilitarian purposes. Earth colors camouflage the wearer in their surroundings, durable fabrics provide a shield against the elements, and cargo pockets give accessibility and storage. This made me think about the different uses for my hair piece. Just to name a few- use it to secure an updo hairdo, as ornamentation, or a utensil to eat with some delicious hamachi sashimi! The colors I used had some clever names. I think “money” is my favorite. It’s so honest! Published on September 10, 2009 in Projects. 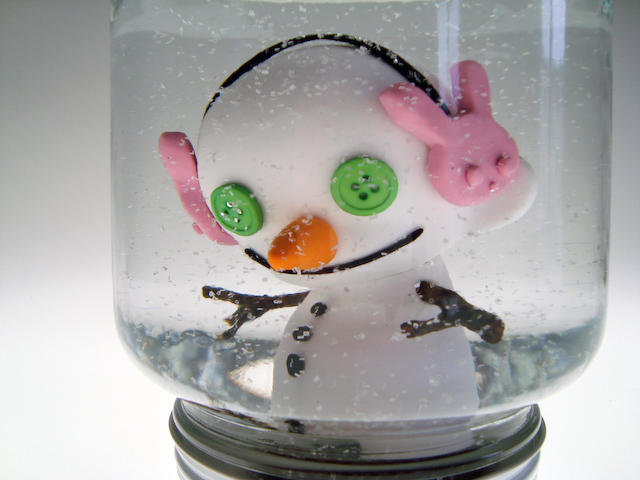 0 Comments Tags: DIY snow globe, Kid Robot, Munny, Munnyworld custom contest, Yellow Cherry. 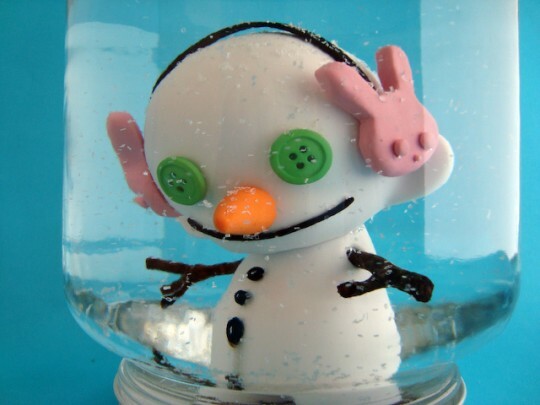 I decided to create a snow globe with a mini Munny! I did some research on the history of snow globes. I found that they have been around for more than 125 years. They first appeared as a successor to the paperweight. In the 1800’s they were considered to be a Victorian upper-crust souvenir. One of the most famous snow globes is the one of the Eiffel Tower that was introduced at the Paris Exposition in 1889. Today, snow globes not only serve as souvenirs and holiday decorations, they also commemorate people or events. My snow globe was a tribute to the Munny. 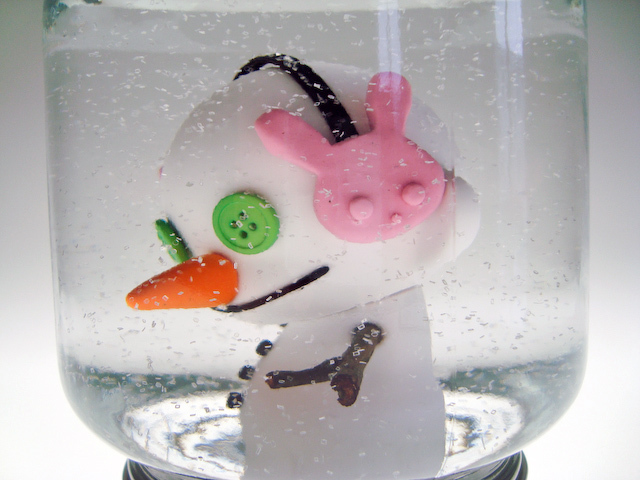 I transformed the Munny into a snowman and encapsulated it in a slow-motion snowstorm. 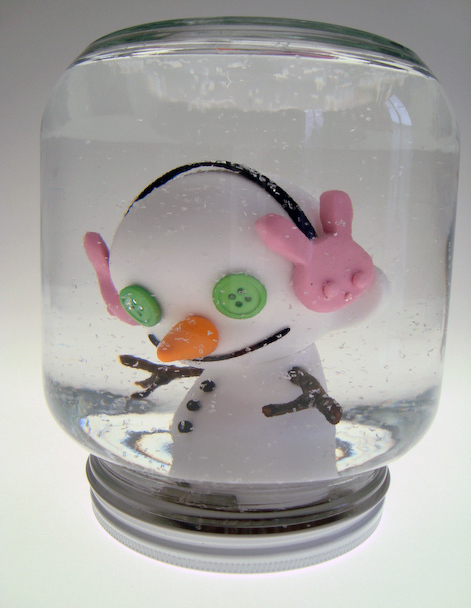 Creating the snow globe involved quite a bit of thought because the entire Munny needed to be waterproof for its underwater environment. There are twigs for arms, a sculpted carrot nose, button eyes, and fuzzy bunny earmuffs for warmth. 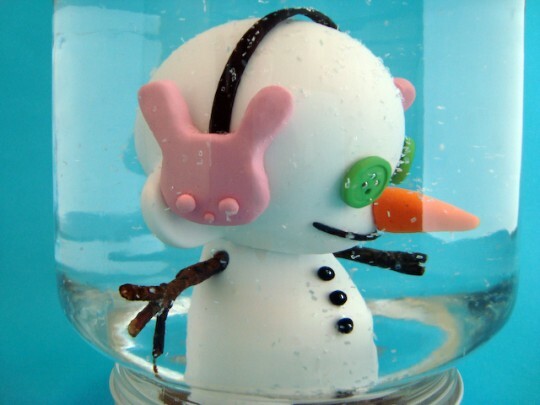 I think my Snowman Munny turned out nicely. I hope Kid Robot will find the concept of my snow globe enchanting and nostalgic. At the very least, one damn good paper weight! These are just a few more photos with a different backdrop. . . fancy. Published on August 27, 2009 in Projects. 0 Comments Tags: handmade plush toys, plush cat doll, Yellow Cherry. 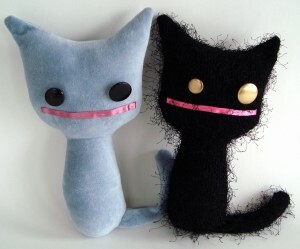 I had the honor of designing some plush kitties for my pal Charlene, who lives in Canada. She’s a huge supporter of handmade goods and custom living. 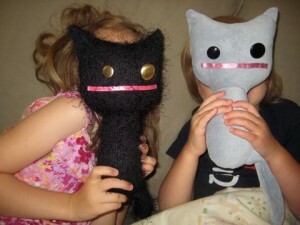 She requested a pair of cats that resemble the ones in her neighborhood, whom her girls refer to as Meow and Meow Meow. Meow is a jet black Bombay cat, and Meow Meow is a silver gray Chartreux cat. For Meow, I found this great fabric that had tinsel-like strands attached to it. I thought it had the perfect texture to make a kitty with wild, unkempt fur. To contrast Meow’s straggly fur, I thought a soft velour would be nice for Meow Meow. It would also make a good snuggle buddy for a two year old. 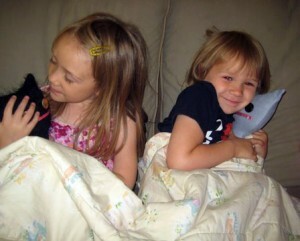 The kitties were a success and are very well-loved in their new home in Canada! Published on August 18, 2009 in Projects. 0 Comments Tags: custom vinyl stickers, sf sticker co. I spent an afternoon down at SF Sticker Company’s factory learning about the lost art of screen-printed stickers. The process is very labor intensive: making films from digital files, color separations, coating screens with emulsion, transferring the image, printing, laminating, cutting, and packaging. I got the task of sorting and packaging stickers for a Thrasher Magazine job. They had an order for 10,000 pieces in mixed bundles of red, black, and blue “Skate and Destroy” stickers. My favorite part of the experience was using the heat sealer and listening to Howard Stern podcasts! Published on November 21, 2008 in Projects. 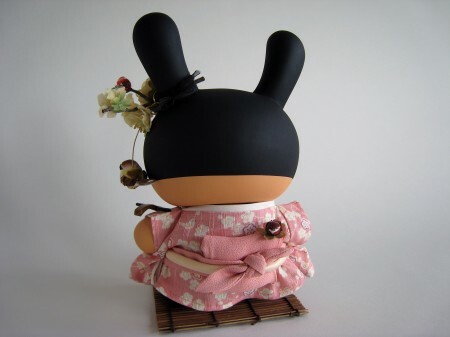 0 Comments Tags: Custom Dunny, Geisha, House of Flying Daggers, Huck Gee, Kid Robot, Yellow Cherry. 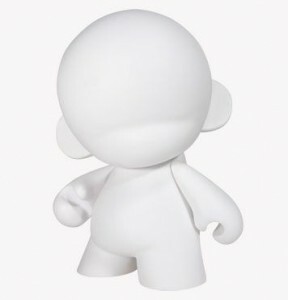 I took almost 2 years off from designing jewelry to experience the world of custom vinyl toy making. It all began as a 3 month internship with Huck Gee which led to a creative director position. I had a lot of fun working with many different types of medium- wood, clay, paint, fabric, etc. Not to mention, working on a larger scale than jewelry was quite freeing. 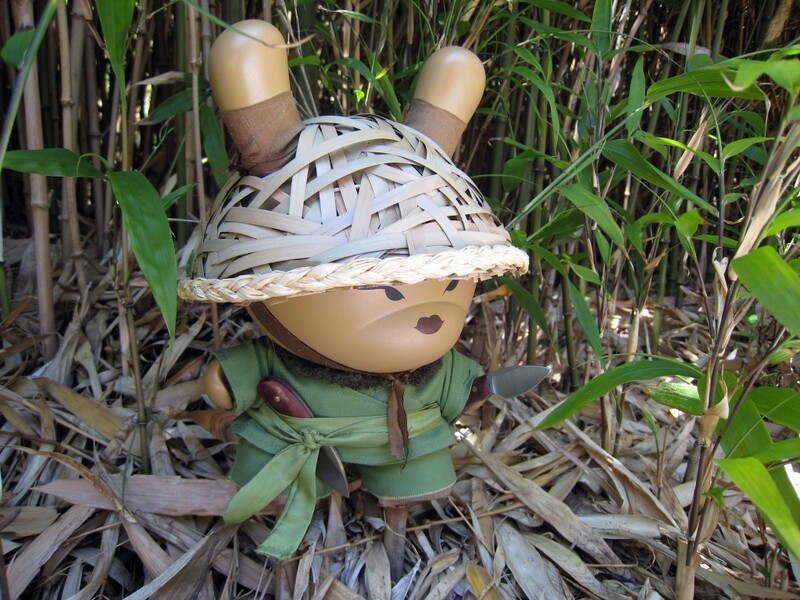 The figures I customized are called Dunnys. They are a product of Kid Robot. I think the name Dunny comes from the combination of the words bunny and dummy. Anyways, the best part of my toy job was that I got to create a few of my own special Dunnys to keep. This is my apprentice geisha, or maiko. 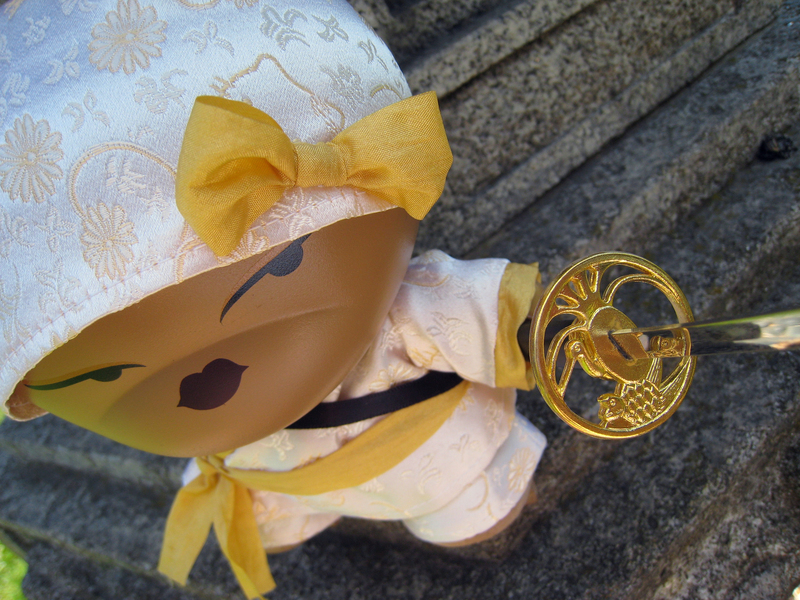 I decided not to give her the white make-up because she is a geisha in training. 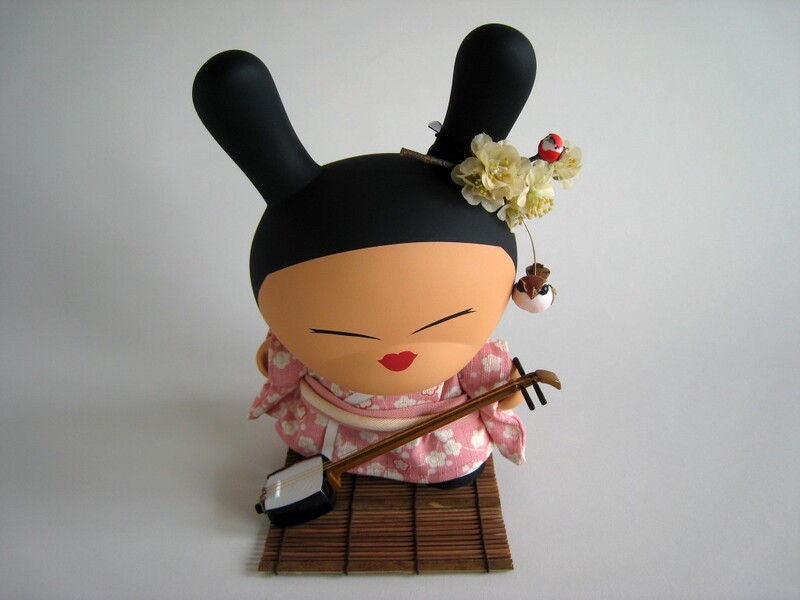 One of the skills a geisha must learn is how to play the shamisen, which is the instrument she is holding. 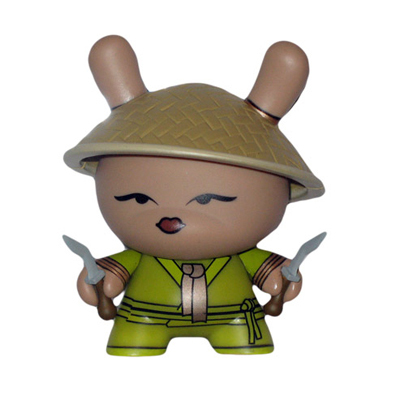 I was inspired by the movie “House of Flying Daggers.” The most intense part of this dunny’s outfit was weaving her hat. Let’s just say I have a new found appreciation for the art of basket weaving. This creation was well received by Kid Robot. 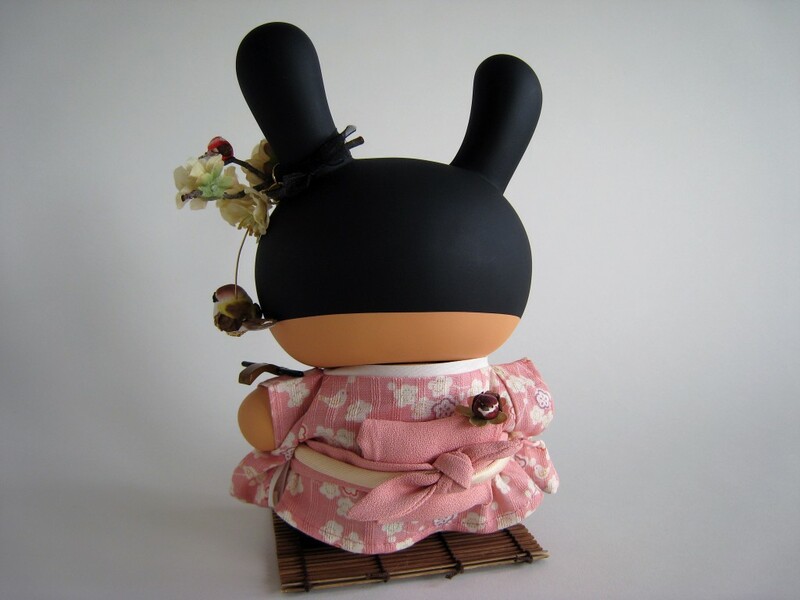 They produced a 3″ version of it for Dunny series 5. You could only get this figure if you got 1 of the 600 golden tickets hidden inside the box. In other words, it was very exclusive! Who needs camouflage when you have a panda skin hood and cape for a disguise? No pandas were harmed in the making of this ensemble. His wooden staff is actually a sword. Sneaky! Do not mistake her ninja outfit for pajamas, she’ll cut you. Hiya! Who knew you could find Hello Kitty satin fabric? I couldn’t help myself.